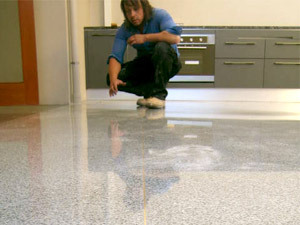 Terrazzo floor polishing Adelaide in heart of South Australia is similar in process to marble floor polishing, except different diamonds are used to cut and polish the terrazzo, using a special terrazzo floor hardener which seals and strengthens the stone surface. 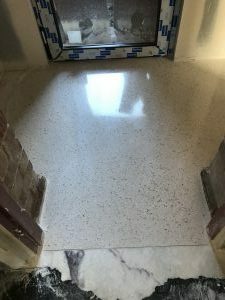 Terrazzo is a type of composite material used for floors and walls and which is made up of marble, granite, quartz and glass chips mixed with cement. After curing, the terrazzo is ground and polished using floor grinding machines. Terrazzo was first used in Venice, Italy and is one of the hardest and most durable floor product that can be used for flooring. Contact us today to get your free terrazzo polishing quote! Or call our offices 0408 133 379. Renaissance Stone and Concrete Polishing is a company focused on improving the quality, integrity and durability of stone and concrete floors. 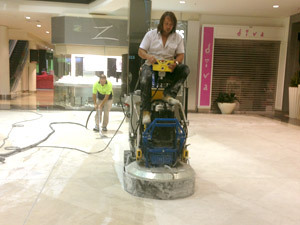 Renaissance Stone and Concrete Polishing has the very best equipment for grinding, honing and polishing and bush hamering of large marble, granite, terrazzo and concrete floors. Terrazzo • Marble • Granite • Polished Concrete • Limestone • Travertine • Porcelain • Tiles • and much more. If you've got a surface you're not sure what to do with, give us a call.